I started a mini quilt on the weekend with the intention of posting it on Monday, but I seem to have underestimated either how long this was going to take to piece or maybe more so the lack of sewing time available on the weekend. 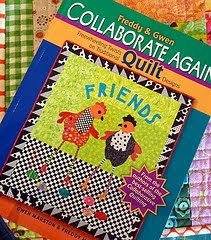 What caught my eye in this book was the Garden Path quilt. It is made with a wide variety of prints in a largely pastel palette, and pieced with strips sewn together to make Strata, which is then re-cut and assembled freeform. I really wanted to try the intuitive design and a mini quilt is a great way to try out different techniques. 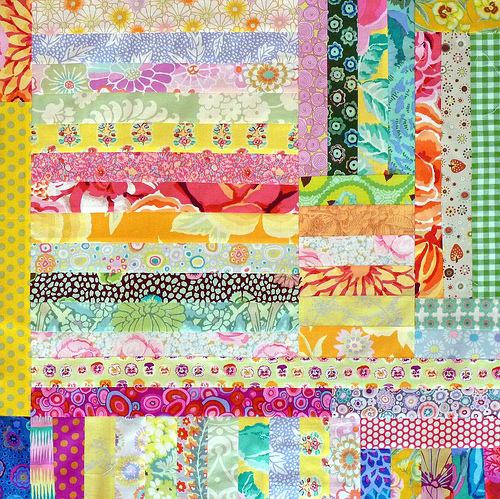 I have used both large and small scale pastel prints by Kaffe Fassett as well as a few high-contrast fabrics to add depth to this mini quilt. In my next post I will detail the steps that I take to ensure that a quilt top and the backing are centered. 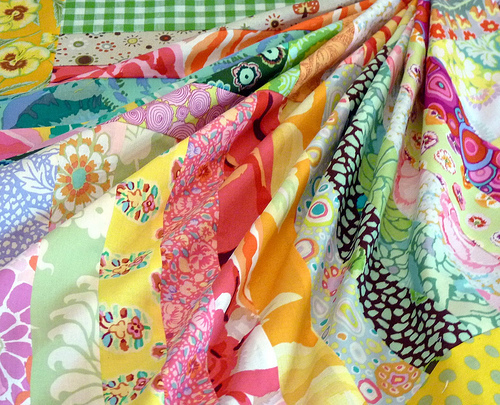 Although ensuring the quilt back is straight is easier for a mini quilt, the technique does apply to quilts of all sizes. I am sure it is still Monday somewhere in the world. Right? it's definitely still Monday here! and raining!! (I think I saw Noah on his ark not too long ago). What a lovely quilt you have made - a definite ray of sunshine is this rainy neck of the woods. Oh Mama, that is some SERIOUS eye candy! Love your Blog. I found you through Annie. positively glowing. 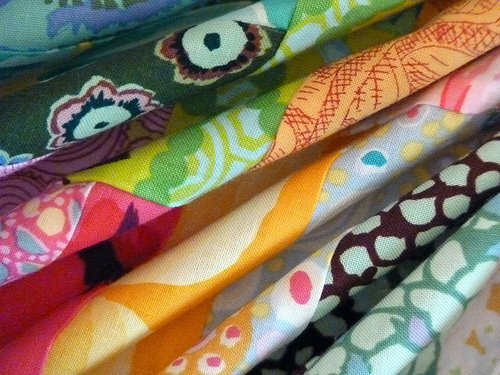 love seeing the fassett prints in this mix, sometimes i have a hard time seeing myself use them! I think it's beautiful. I just got this book on Thursday and I'm really enjoying all the inspiration! It's gorgeous. I'm sure you'll love it when you're done. i always love seeing your stash ... and wow, what a stash! I have that book and absolutely love it! Your rendition of their technique is just beautiful! What a great mini! Lovely Rita! Bright and very cheerful, the Kaffe's look fantastic. I'm reading it and it's Monday here! Doesn't matter to me what day it is. I always love to see what you are making.